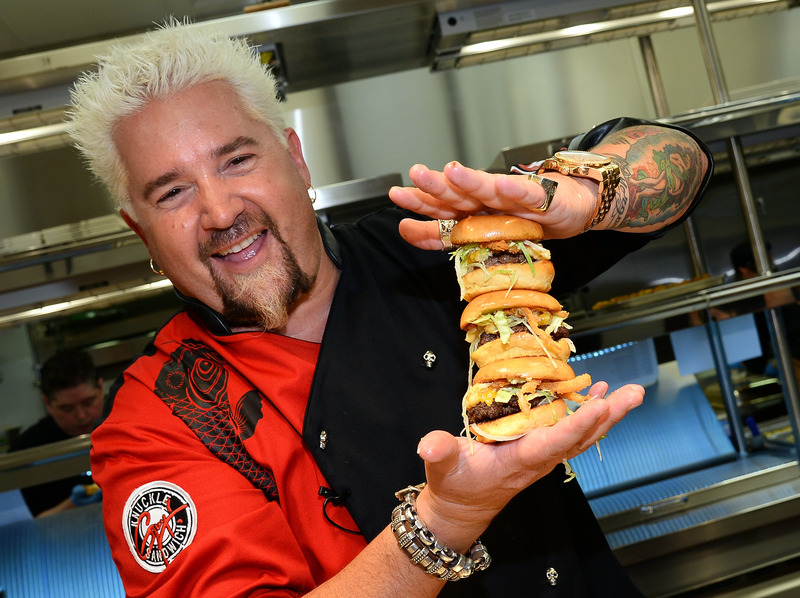 Which Guy Fieri Hairstyle Is Truly "Out of Bounds?" I don't think we'll ever take Guy Fieri's infamous frosted tips for granted ever again. The phrase "You don't realize what you've got 'til it's gone" has never rang so true as it did when I saw Guy Fieri with "normal" hair on Wednesday morning. Let's be honest, Fieri's hair is a huge part of the reason why you love him (or don't love him), the other parts are his cheesy catchphrases and the monstrosity that is Guy Fieri's Vegas Kitchen & Bar menu. Seeing the Diners, Drive-ins, & Dives host without his signature hairstyle is truly "out of bounds" — as Fieri himself would say. Look, we're all guilty — whether you're a Triple D fan or not — of, at some point or another, having a chuckle about Fieri's dated hairstyle. I mean, those tops are frosted and they defy gravity by either the amount of spicy food Fieri eats or some seriously strong hair gel. But I'm fairly certain we won't take these tips for granted again because Flavortown just wouldn't be the same if Fieri actually did decide to get a "normal" hairstyle. Or would it? The Cons: This is creepy as hell. Honestly, I think I might have nightmares. Also, this style would absolutely give Fieri negative street cred and would force him to sell his red convertible. Because no one likes a guy who pairs this hairdo with a red convertible. I'm sorry. The Pros: I mean, this hair is Guy Fieri. Also, it's grown on me and I know it's grown on you, too. The Cons: Sometimes I catch myself staring at Fieri's hair and not the slow-cooked barbecue brisket he's raving about. The struggle is real. The Pros: This is just hilariously perfect. It's also a great starter-style on the road to normal hair for Fieri. He wouldn't have to fully give up his bleached-blonde spikes and he'd have a food-related look. Perfection. The Cons: I mean, Justin Timberlake did it first. How do you follow that up? Also, Fieri might accidentally try to douse his hair in Donkey Sauce and eat it after getting too excited about exactly how much it actually looks like ramen. That would be dangerous. The frosted tips are a big part of why Fieri gets to act like a total nut job on television. Personally, I don't think this man would be allowed back in Flavortown without them (and he created the idea of Flavortown, so that's saying something). LONG LIVE FIERI'S FROSTED TIPS — especially when paired with those hater-blocker sunglasses.